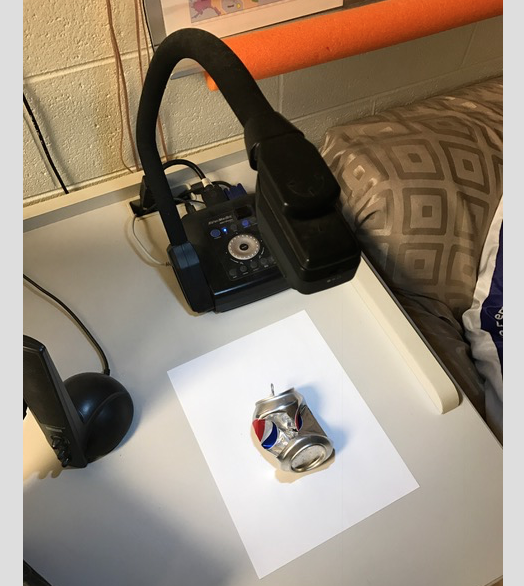 In an effort to better understand my high school students' knowledge of what is happening during phase changes, heating curve calculations, and the ever popular can crush demo, I run them through a series of activities. First, I ask my students "What Temperature Does Water Boil At?" 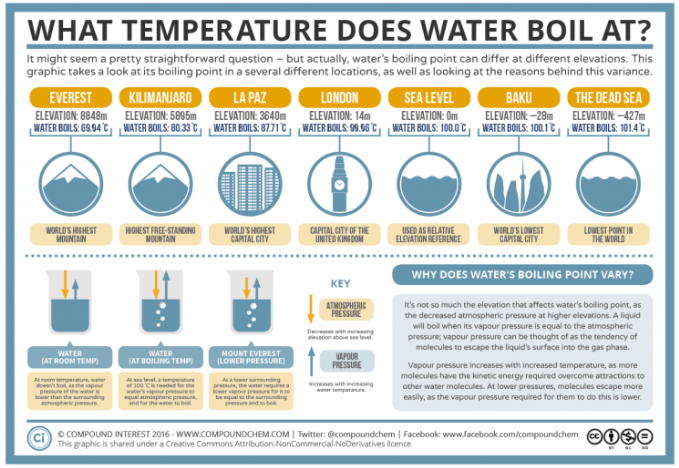 This is in reference to the same question mentioned in the infographic What Temperature Does Water Boil At? by Compound Interest. We discuss the importance of atmospheric pressure and how that relates to changes in a substances boiling point. This is then followed ;by boiling water at room temperature in a bell jar with a vacuum pump and of course then using the vacuum pump to run several other demos. Second, with a class set of iPads, I have them view the heating curve activity from AACT. 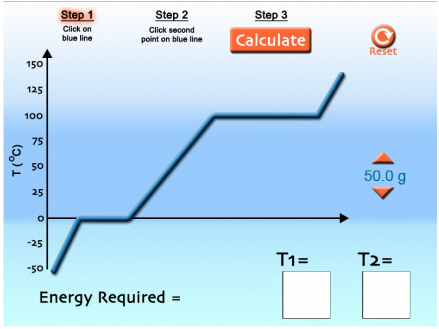 It is a members only simulation activity but the diagram can be found in most chemistry textbooks or on line if you search heating curve of water. 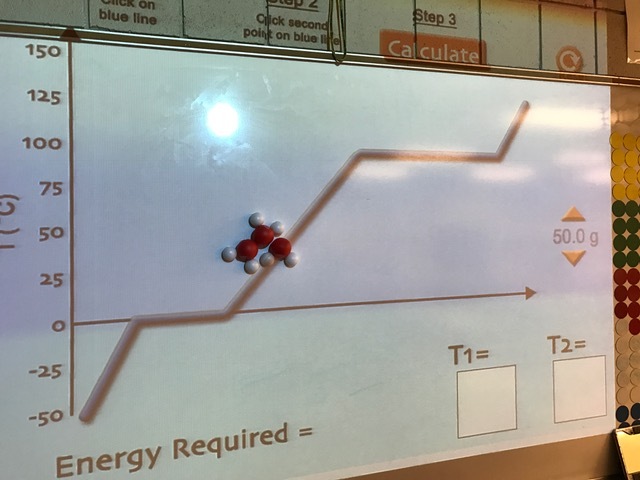 We discuss the flat lines found on the graph during the phase changes and why on the side of a box of Hamburger Helper the cooking times are different if you live at high altitudes. Third, I run my students through the calculations associated with specific heat of ice vs water vs steam and the Heat of Fusion and Vaporization during the phase changes. The simulation allows us to check our answers. However, what was really unique about using the AACT simulation was that as we clicked on the parts of the graph we saw a visual representation on the particulate level of what the water looks like at that location marked in the boxes as T1 and T2. 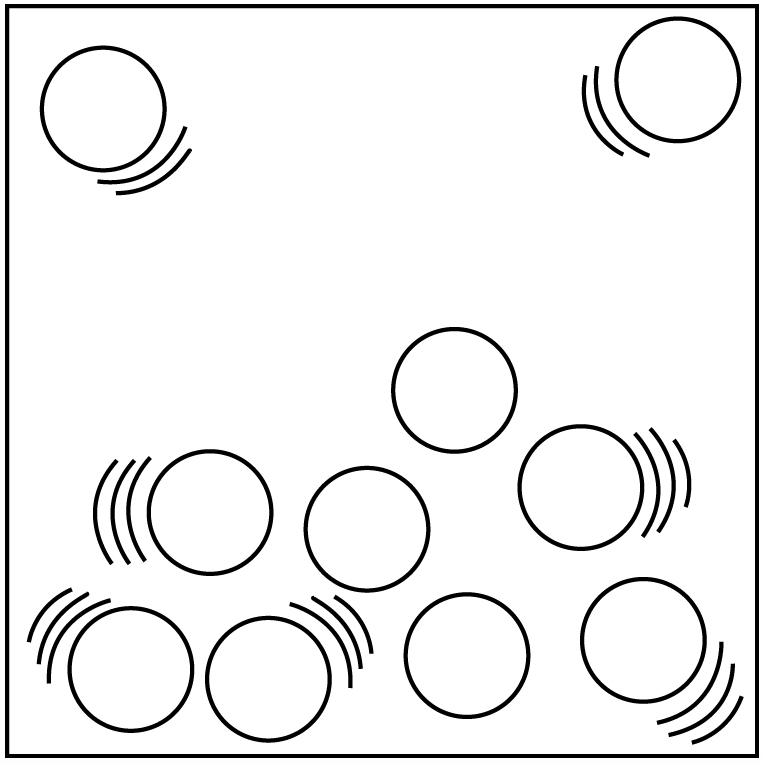 As you can see below, water is depicted as a single circle, but what my students noticed was the so called "trail lines" that were associated with the circles. My students quickly understood that the greater the number of trail lines means that the particles are moving faster. 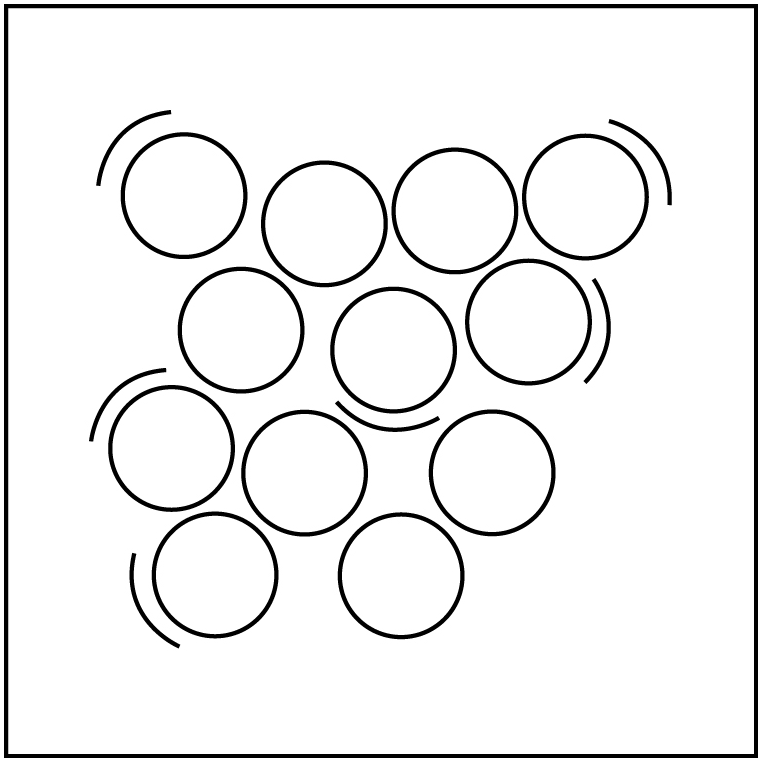 We noticed that some of the circles in the same pictures had the same number of lines but some were shorter than others. Students understood this to mean that not all particles in the same phase are moving with the same amount of energy. I don't know if that was intended, however it got the concept across so I was excited to see where this would go next. Particle level representation found on the AACT Heating Curve Simulation. 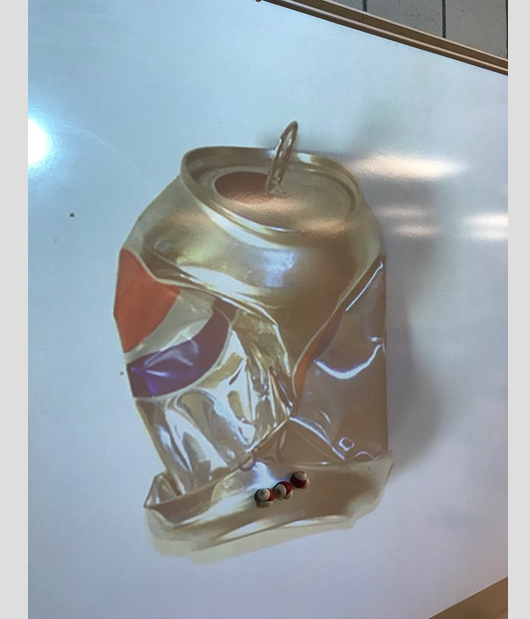 Lastly, I performed the can crush demo for my students. 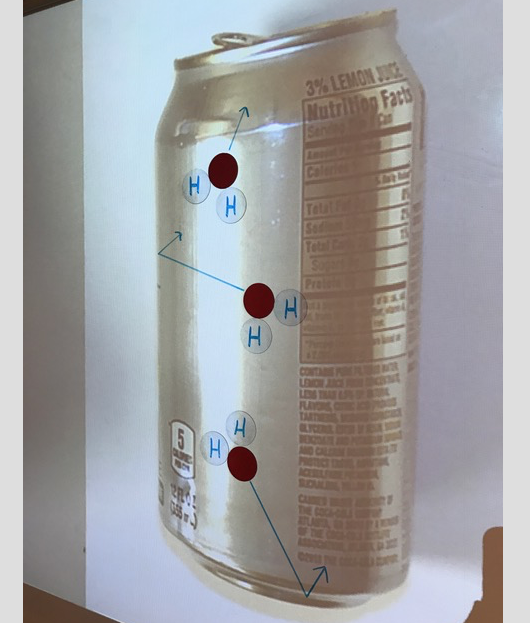 I wanted them to describe what was happening on the particulate level as the little amount of water inside was heating up and then quickly condensing as the can was inverted into the water. 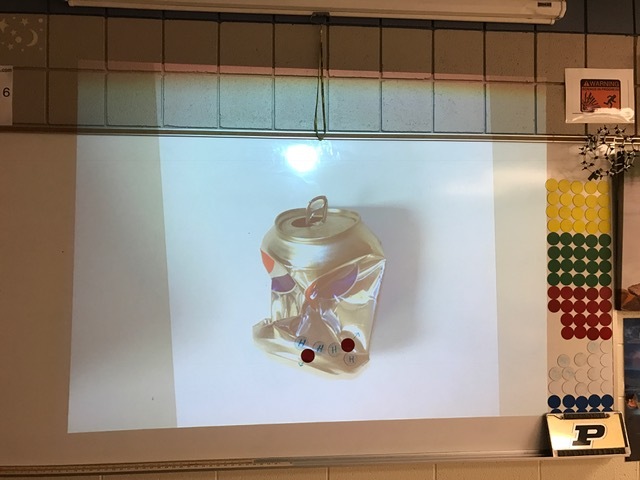 By using a desktop camera to simply project the image of the can before and after crushing on a magnetic board without the screen pulled down I asked my students to represent what was happening on a particle level during each part of the demo using magnets, colored markers, water molecule models, or snatoms. I was fascinated that many of the classes included those "trail marks" that they had seen previously in the simulation we had used. Other groups used arrows like I have seen used Modeling Instruction. I have included several pictures representing the activity and some of the representations my students created. I invite you to comment or ask questions below. Using Snatoms on the projection of the AACT simulation heating curve. If you have never used the CAN CRUSH demo, check out Steve Spangler's Can Crusher video and directions. 1.5 days to do all the activities including lecture on heating curve calculations. Web addresses are listed above. For the bell jar activity, I use a digital thermometer from Flinn scientific to show the temperature of the water as the pressure drops. 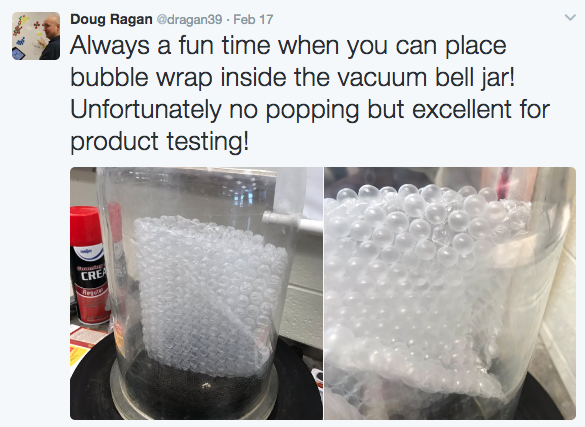 I also place an assortment of other items in the bell jar individually: a sealed syringe, a squished sealed cheap plastic water bottle, shaving cream, balloon, and now bubble wrap. I use peeps and marshmallows when I introduce gas laws. Snatoms models can be ordered from Veritasium and the colored magnets can be ordered through Flinn Scientific. Steps are provided in the discussion listed above. The heating curve activity from AACT has teacher guides and student guides available for paid members. I would like to thank AACT and when I had a problem with the simulation not loading properly on the iPads I contacted them and I received a very quick response and the problem had been fixed. They also gave me permission to share the photo of the simulation. Thank you AACT! The creator of the Compound Chem infographics will be a guest speaker at this summers ChemED 2017. Students who demonstrate understanding can plan and conduct an investigation to provide evidence that the transfer of thermal energy when two components of different temperature are combined within a closed system results in a more uniform energy distribution among the components in the system (second law of thermodynamics). Assessment is limited to investigations based on materials and tools provided to students. Emphasis is on analyzing data from student investigations and using mathematical thinking to describe the energy changes both quantitatively and conceptually. Examples of investigations could include mixing liquids at different initial temperatures or adding objects at different temperatures to water.